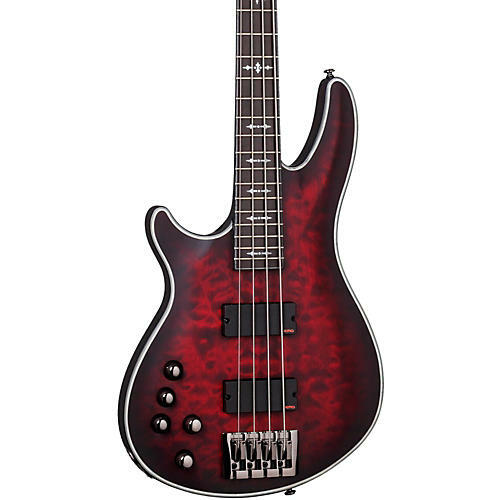 Schecter's Hellraiser Extreme-4 left-handed electric bass guitar is a premium instrument made with top notch woods and electronics. This bass is truly a work of artistic craftsmanship. The Hellraiser Extreme-4 has a multi-laminate maple and walnut neck. It's made from 3 pieces of maple and 2 center strips of walnut. This well balanced combination of select wood takes the bright tones of maple and adds a dark tone from the walnut strips. It's often used for Thru neck construction, giving the acoustic tone of the instrument a perfect string vibration transfer to the body. The ebony fingerboard has a snappy, crisp attack with the density of Maple, but with more brittle grains, oilier pores, and a stronger fundamental tone than Maple. It has a tremendous amount of percussive overtones in the pick attack, that mute out shortly thereafter to foster great, long sustain. Inside the Hellraiser Extreme-4 are both single and dual-coil EMG 35TW pickups, each with its own output. The single-coil mode is a new version of the J pickup built in the CS (ceramic and steel). The dual-coil mode is the popular CS dual-coil consisting of two coils opposite one another creating a pickup similar to model 35CS. A push/pull volume pot allows you to change from the clarity of a single-coil to the fatness of a dual-coil. Grover Bass tuners top off this bad boy. The Grover ˜MINI" is lightweight, compact and durable for modern electric basses. Gear ratio is 20:1. Housing is specially machined to achieve the precise tolerance that prevents slippage and allows fine tuning. Sealed gear box has permanent lubrication that makes the MINI friction-free for life. Limited lifetime warranty on all guitars.